Scotland’s favorite son, “The Bard” Robert (also Robbie, Rabbie) Burns is celebrated worldwide on his birthday January 25th. Born in 1759, he is regarded as Scotland’s national poet and is best known for his poem (and song) “Auld Lang Syne” often sung (or attempted to) on New Year’s Eve (called Hogmanay in Scotland), and “Scots Wha Hae” served for a long time as an unofficial national anthem of the country (okay lets’ not mention the recent election…Oops, sorry). Other poems and songs of Burns that remain well known across the world today include “A Red, Red Rose,” “The Battle of Sherramuir,” “Tam o’ Shanter,” and “Ae Fond Kiss” and a boatload of others. Burns was also a collector of Scottish folk songs. He wrote in Scots gaelic and English (especially when he was pissed at the English). 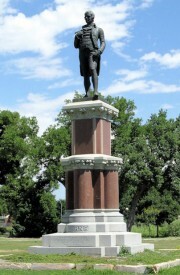 In Denver’s City Park just southwest of the pavilion, stands a lonely statue of Burns. Well, standing 27 x 8 x 6 ft.( the figure of Burns is approx. 10ft. tall) maybe not so lonely, but it looked so forgotten. Maybe because I didn’t know it was there and just stumbled on it. It’s been in the Denver park over 100 years. According to artsandvenuesdenver.com and www.waymarking.com it was erected in 1909, but several sources, including 8 at www.denverlibrary.org give the date as (July 4) 1904. Since I found a postcard of the statue dated October 1907, my money would be on the 1904 date. “A Poet Peasant Born Who More Of Fame’s Immortal Power Unto His Country Brings Than All Her Kings.” According to a number of resources, the sculptor of Robbie’s likeness was William Grant (1849-1919) Stevenson of Edbrooke, Scotland. The statue was given to the city by the Scots Caledonian Club of Colorado, which was a Denver, Colo. fraternal and benevolent organization of Scotchmen and descendants of natives of Scotland residing in Colorado organized in 1880. Minute books of club meetings with a few letters, receipts, etc. inserted from 1895 to 1909 are on microfilm at the Western History/Genealogy Dept., (5th floor) of the main Denver Public Library. Colo. Editors note: Thanks to many efforts of folks who posted about the Denver Burns statue including waymarking.com, Denver Library, ChicagoScots, Denver post, Wikipedia, etc.). Co-founder of Belize Natural Energy Company, Susan told the story of how the company began and positively transformed a country, and about XJet ,founded by Josh Stewart, that is receiving worldwide attention for industry excellence – All the while crediting both companies success for following the EDUCO Business Model which mines the potential energy in people. S1 00:00	We have a lot of guests on this show, but not too many people have transformed the nation. S1 00:04	I was really thinking about that because I looked at her video yesterday, and I started reading some of her background, and I really thought about that, that we get a lot of economists, we get a lot of strategists – I don’t know if we’ve ever interviewed anyone that’s really truly gone out and transformed a nation. So it is our pleasure this morning to have Susan Morrice with us. 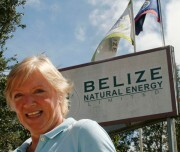 Susan is the CEO and Co-founder of Belize Natural Energy. Good morning, Susan. Thanks for being with us. S3 00:32	Good morning, Mike. It’s my pleasure actually. S1 00:35	Listen it’s– really, I was amazed. I started looking at your background – I saw one of your videos. You have had quite a life. I hope that some day you write a book, because if you write a book about your life I want to buy a copy. Really, you’ve had a very interesting life. Well, I don’t even know where to start. I think I’ll just– I’ll continue with Belize Natural Energy. When I think of Belize, I think of a country that’s got beaches, and vacationers, and stuff like that. You went into a country, I assume that had no– only gas before, and created the oil industry for Belize, correct? S3 01:20	Mike, you’re exactly right. I actually– it was about 30 years ago. I went to Belize, and actually fell in love with the place and the people. And that is a key factor actually, because I really wanted to make a difference. I know it even sounds corny, but I think all of us have that in us, especially when we’re younger. We really feel– we lead out with that spirit of, could be adventure entrepreneurialism, and that’s what happened. So I teamed up with a Belizian, a chap called Mike Usher, whom actually I met in Denver. He also wanted to make a difference, and we both had a gut feel, even though there were 50 dry holes. Over 50 years, all the big boys had drilled in Belize – onshore and offshore – and it was declared internationally there was no oil in Belize. Everybody had given up. I just knew. I absolutely knew it was there. You know when you get a sense that this is going to be special? S3 02:35	And darn it, it was. It was really special because nobody, nobody would believe us. So, we gathered together a group of original investors – many from Ireland – who also had actually done a course with me on Understanding How The Mind Works. I think this will be a key component to share with your viewers, because this is for everybody. And we put together Belize Natural Energy and drilled the very first well. I’m sure many of your listeners, especially in Colorado and Texas, know that it takes statistically about 15 wells, wildcat wells, before you hit oil. S1 03:20	I didn’t know that. Is that really the ratio? About one of every 15 wells in terms of wildcatting that comes in as a payer? S3 03:29	Yeah, and it’s good for your listeners to know that because that’s an awful lot of money. That’s millions, let’s just say, down the hole. But we hit it on our first well and the best oil in the world. So light they can actually put it into their generators in Belize without refining it. Can you imagine? S1 03:52	Wow. That’s pretty sweet oil. But there had been, before you went in there, some of the big boys had been in there and they had hit 50 unsuccessful, dry holes, right? Before you hit yours. S3 04:06	That’s it and in fact, the president of Shell was pretty clear about telling me that I had better stop talking about Belize and get a life [laughter]. Otherwise, I’d ruin my geological reputation [crosstalk]. S1 04:20	Was that Hoffheiser? S3 04:25	No, it wasn’t. It was actually a wonderful chap called Marlan Downey. He was the president of Shell Pecten. S1 04:30	Okay, all right. S3 04:32	And he knew me quite well and he was trying to do it for my own good, if you know what I mean? S3 04:40	But they now– Shell now buy the majority of all our oil because, you see, it’s the best oil in the world. It’s 40 degree gravity. We even get almost [inaudible], Louisiana Light. And so that upgrades all the Mayan Crudes in the area. S1 04:54	Now, is there a lot of oil there? Are you still finding new pockets of oil, or what does it look like? Is this going to be a continuing growing industry for Belize? S3 05:06	It will be a continuing growing industry, but you know what’s even more important? It is that we have actually really tapped into something that is unlimited. Oil has– you discover an oil field and it goes for maybe 20, 25 years, and quite often peters out economically. We have actually tapped into the potential, the energy in the people. That is what is really bringing forward a whole new vision, because we are stepping into the LNG market, the electrical markets. We’re already in the propane butane for the little local people in Belize. And so what we’re doing is really going [inaudible] and mining the potential within is one of the slogans that– the mission statements of BNE, and that’s what, again, what we learned how to do that on the Educo seminar. S1 06:07	Now are you bringing in– I’m sorry. Are bringing in folks to work the oil industry down there, or are you training local Belizians? S3 06:17	Mike, that’s a very good question. Usually throughout the world you bring in ex-pats to do the job but we made a very clear decision to train Belizians – train locals. Now we’re 98% Belizian and that is just unheard of. We’re also the number one revenue generator in the whole country. S3 07:01	Originally Belfast, Northern Ireland. S3 07:04	It makes the whole story even more incredible, because there hasn’t been a drop of oil found, certainly in Northern Ireland yet, by the way I’d say. I really went to– went to Trinity as a– studied geology, which was fascinating, but it was a key turning point. And about a couple of days ago, you spoke about success traits. I think you used Warren Buffett and his paper around– and a– or couple of the examples, The Stable Boy selection. What are the traits of super-achievers? That’s what I wanted. And I was fascinated by your program. You even talked about your own, I think, it was lawn mowing business. S3 07:51	Lawn mowing business. S1 07:52	Yeah [chuckles]. That’s right. It was not a glorious start, but I did have a lawn mowing business. That’s true. S3 07:57	But it’s a brilliant start, because your parents encouraged you to get out and be all you can be. In other words, that independent spirit, and that’s a key to success. To looking at what is the model of the super-achievers. S1 08:44	Susan I’d like to get back and just ask you a little bit about– you’ve just gotten back from Dubai, where they have lots of oil. What is the health of the oil industry? I mean there’s a lot of people– the environmentalists would like to see it go away. They’d like to use solar, and they like to use wind. What is the health of the oil industry right now? S3 09:07	The bottom line at the moment is that the fossil fuels, the oil and gas, are very necessary to fuel the industrial economy. However, we want to really bring out all those inventive traits to look at new solar, new wind, because we need to find better ways to do that and tidal and current. And so we are also getting involved in renewables. So our oil company, Belize Natural Energy, the people are– the employees are like partners. They come forward with all sorts of ideas, all the time. For instance, propane-butane for the local people. So when you really bring forward your people, which is the key energy, then you get that creativity across the board. And it’s not one or the other. It’s a balance. S1 10:02	Yeah. You mentioned that your employees become partners. It sounds like you really empower your employees to make a difference in your company? S3 10:12	Very much so, because that’s what it’s about. I say, and in fact we all say, we’re all in the energy business. Because it’s the energy within us that drives us forward to be all we can be. And so we train everybody in understanding and drawing forward, that’s where the word educo comes from. It’s the Latin word to draw out. So, we send all of our employees along to various training courses, but the key one is the Educo seminar, which is designed to draw out that, let’s say, entrepreneurial spirit, pioneer spirit, creative spirit. S1 10:54	Do you give the Educo seminar here in the United States or is that just something for the employees of your company? S3 11:00	No, no. It’s for everybody and I don’t give it actually, I’m a recipient. I went along 12 years ago. Actually, when somebody asked me if I could come along and teach how I did the various entrepreneurial things, I said, “No. You just do it.” And I realized that there was more to it. I asked myself the question, “Why do some people go forward, like a Warren Buffet, or Gandhi, and others stay back. Stay back in themselves?” And that’s when I researched everywhere – throughout the world – who knows best. Who’s got the best training program, to really understand the mind and practically bring it out today? It was brought to Dr. Tony Quinn, Educo. E-D-U-C-O. S2 11:52	Susan, do you see yourself sort of as an angel investor? S3 11:58	I don’t think I’ve ever really been called that Peggy, but it is– once you understand and bring forward other people’s potential, it’s a bit like giving the fishing rod and not just the fish. Because what you want to do is, when you invest in somebody– I’m thinking now of Josh Stewart, who is the founder of XJet. It’s a private jet company that is literally soaring like a rocket right now. It won the number one spot, FBOs throughout the Americas, and it’s now setting up in Dubai, Saudi, London, and Paris and is being courted by some key investors globally. So yes, maybe angel, or maybe it is bringing the angel out in everybody. S2 12:50	So, you’re able to help these people that you see in industry or a business that you think has potential, and then you’re able to step in and, sort of, give them that leg up? S3 13:00	You know its– I do it the other way around. I actually know very little about jets, except it’s nice to fly on them. It’s investing in the human being, that human being, their true nature. So quite often I’ll see it, but they won’t see it and that’s where the Educo course comes in brilliantly. S2 13:39	Warren Buffet [laughter]. S1 13:40	– the female Warren Buffet here. We go from oil to jets. I guess there’s a correlation because you got to put jet fuel in them, but what’s your next step? What’s your next mountain you’re going to climb? S3 13:52	You know, in fact you’re doing it with me right now. I actually want everybody to know the secret of success within themselves. And so, I’m working with DU and various universities in their MBA programs, and publicly, to tell people that they too have that spirit in them and they can go along and really bring it forward and actually be all they can be. Their kids, our friends, our– the people we want to invest in, and that really, I suppose, is an element you talked about on the first segment – which is bringing a better world. S1 14:36	Right. Now, by the way, how did you get from Belfast to Denver, Colorado? S3 14:43	[laughter] Well, I could be cheeky and say by airplane [laughter]. I was hired by an oil company. I studied geology at Trinity, and I was hired by an oil company way back, over 30 years ago. But when I came to America I thought, “Well you know, I’ve heard about these Americans and the American dream of setting up your own company.” So very, very soon I thought to myself, “Well, I better get on with this and set up my own company.” Because I thought it was the mindset of America, which it was 30 years ago. The entrepreneurial spirit was alive and well. And I think that is the key. We need to understand that we can actually learn it and bring it back to everybody. S1 15:28	Was it a little unusual though for a woman to be starting up her own company in the oil and gas industry? My father worked for a major oil company all his life and I must admit I didn’t see too many female– I didn’t see many female executives within the company, to say the least. I did see some female geologists, such as you, but I didn’t see anybody that was in a position of really running a company or starting one. It sounds to me like you’re a pioneer of that industry. S3 15:56	Well, I think the word pioneer is a good one. I think it’s understanding mindsets what actually holds us back. And I really, literally, thought America was all about setting up your own company and being that entrepreneurial spirit. And then going back and understanding that. It’s almost like having an invention, or having a mindset and looking back to see how other people can do the same thing. That’s what Educo has done and that’s what I want to do for everybody. S1 16:36	Well, thank you so much for being with us this morning. On a cold and snowy Veteran’s Day in Jim Lyons’ 30th floor office at the law firm of Lewis Roca Rothgerber LLP overlooking downtown Denver, the Celtic Connection had an informal chat with him about his new book, “Peace Meets the Street: On the Ground In Northern Ireland, 1993-2001”. In that book, Jim provides brief, simple and highly accessible descriptions of the historical problems that led to “The Troubles” and the contemporary political context for why those problems continued until the Good Friday Agreement. He very modestly limits the description of the part he played as the (unpaid) U.S. Observer to the International Fund for Ireland and Special Advisor (also unpaid) to President Clinton for economic development and the peace initiative in Northern Ireland and the Republic. Rather, in the slim 105 page volume, he describes the people of Northern Ireland who participated in the peace process, the risks they took and the courage they displayed. His family tree includes a mother of Protestant stock from the North and a father with Catholic roots from the West, making him an ideal choice for those roles as well as that of Honorary Consul for Ireland in Denver. His early experience as an attorney in his native Chicago working with banks gave him the tools to help develop a micro-lending program for businesses in Ireland. 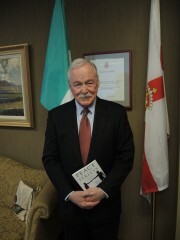 He sent former First Lady and Secretary of State Hillary Rodham Clinton a copy of the book and in response she sent him a letter in which she said “I appreciate your thoughtfulness and good cheer, and know that Bill joins me in expressing our gratitude to you for your important and transformative work in Northern Ireland.” The book is available at Amazon.com. All profits will be donated to the Victims Fund of Omagh in honor of the 29 people killed in the Real IRA bombing of August 1998. Celtic Connection: In your book, you mention that your father’s family is from Donegal – where is your mother from? Lyons: Fermanagh and Tyrone as near as we can tell. Originally from Scotland. They probably came over at the tail end of the Ulster plantation. Her father was a Glassman and her mother was a McGuiness and they could be from anywhere. CC: How long did it take you to write the book? Lyons: Years. Because I kept picking it up and putting it down. Finally, last spring and last summer I felt like it was time to sit down and get it done. CC: Did you write it from notes or a journal? Lyons: I had some notes but didn’t keep a journal because in the thick of the action you couldn’t keep a journal and do the job, but I had the reports that were submitted quarterly to the IFI (International Fund for Ireland) to work from, I had copies of my own correspondence with the White House – most of which had to go to the Clinton Library – so I had to go down there to read copies of my own memos. And I had a pretty good recollection of the people who are in the book that I worked with and some of whom I still see. The better part of it was memory and help from an international student from CU, Melissa Field, who traveled to Northern Ireland and did research for me. CC: Why did you decide to write the book? Lyons: I decided that there were people involved in the peace process who were unsung heroes. They were known in their communities and other communities. I didn’t think that people in the United States who followed Northern Ireland had any sense of who these people were or the extraordinary contributions they made. Even before we got there in the early 90’s, they had been trying to bring some degree of stability and safety, if you will, if not peace within their relative communities, at the height of the Troubles. These people were at risk, their families were at risk and yet they persevered. I thought they were heroic stories that I had been privileged to witness firsthand and I wanted to tell them. CC: In the book, there is much about them but relatively little about what you did. Lyons: That was deliberate. My function in the first instance was to be the U.S. Observer which I was for all the years and my sole function for the first few years. That meant I had the responsibility for seeing that our contribution, which was $20 to $25 million dollars per year, was being well spent. So my initial role was more of an oversight role that, given my personality, ultimately became more of an active role. The treaty that created the fund required an annual report to Congress on how the money was being spent and for what, so my legal responsibility was to make sure that the report was well documented and supportable so the President could report to Congress. In the second part of my role there, the second four years, after I took over for Senator Mitchell, then my role became broader, more of an activist role. But that didn’t change the fundamental aspect of the story. If you wanted to do something in West Belfast, you clearly had to involve Geraldine (McAteer) from the Nationalist/Catholic community and you had to involve Jackie (Redpath – founder of the Greater Shankill Partnership) and May Blood and Des McCarthy. The story is still theirs. I said in some exasperation in a public setting at one point that the policy of the United States was not for a united Ireland but an “agreed” Ireland. I got a call from the White House the next day saying that they read it in the overnight clips and asked if I’d really said that. I said I did and they said we like it and we think we’ll take credit for it. I said help yourself, help yourself. But I didn’t ever really think it was about me; I always thought it was about what we can do to help these people and their country. They know more than we ever will about what is needed to move the process forward and our job was to help them do that. CC: At one point you describe having to become a State Department employee. Did you receive any compensation for your work? Lyons: No. My expenses were covered and Senator Mitchell wasn’t compensated and I didn’t see any reason for me to be paid. Given the State Department system, they couldn’t figure out a way or find a form so that I could be an employee and not be paid. I came up with a solution that I offered to a bright young lawyer there – I told them that I would send them a letter waiving any payment and they thought that would work. CC: Did you ever feel unsafe at any time while you were in the North? Lyons: Yes – a couple of times. It’s like anywhere else – there are parts of Denver or any city where you shouldn’t go and you wouldn’t feel safe. I never felt unsafe in the countryside because I was with people who knew me or who I had come to know and whose advice I would follow about where to go and not to go. I recall that the first time I flew into Belfast I had an experience about other’s perception of danger. I usually sleep on the plane so I got into London at 8, caught a flight to Belfast and was there at 10. I checked into the Europa hotel, changed and took a walk around East Belfast, crossed over into West Belfast – and I think I look pretty Irish – so didn’t think about it. I got back to the hotel and found half a dozen calls from the Embassy asking me why I didn’t check in with them and where I went. I told them and they said that I couldn’t be wandering around like that and if I wanted to do that they would assign security to me. I said that if you assign security to me, I can’t do my job. Every time I show up somewhere it’s going to be a production. So they understood that and there were a couple of times where I was in parts of Belfast where I felt a little unsafe, but I grew up in Chicago so I’m used to big cities. CC: You were here in 1987 when the Eniskillen bombing happened. How aware were you then of the Troubles? Lyons: LIke most Irish-Americans I knew what was going on and that there was need for finding common ground. I’d been to Ireland in 1985 or 1986 before the bombing and now the Clinton Peace Center has been built on the site of the bombing and it’s doing quite well. CC: Knowing what you know now, are things that you would have done differently or could have done differently? Lyons: At the beginning, I and some others felt that this was a solvable problem and that we, unlike in the Middle East, didn’t have to ask anybody to give up any land or settlements. As time went on, we began to realize that this wasn’t a religious dispute, it was a tribal dispute and once you put it into that context a lot of things come more sharply into focus. Because then you can look past religions at what are the societal and cultural characteristics of the tribes you’re trying to deal with. In this case, they’re both Christians, worship the same God, speak the same language and as a Catholic Irish-American, it took a lot of time and lot of work for me to understand the Orange traditions and practices. Once, while working on the ASPIRE program (CC note: the micro-finance program whose original name was the Entrepreneurial Growth Trust or EGT – which sounds like eejit – hence the name change), I was in Belfast for a meeting on Ash Wednesday and went to a little Catholic church near where the meeting was being held so I went to Mass, had ashes applied then went to the meeting. After the meeting, two bankers from the Unionist community pulled me aside as we were leaving and said “We didn’t know you were Catholic.” My first thought was to say that Catholics aren’t the only ones who get ashes – Episcopalians do too. Then my second thought was that maybe they were saying that even though you’re a Catholic, we know we can trust you and I didn’t go there. Finally, I just said, “I’m an American” and let it go at that and it never came up again. And in thinking about it, at the beginning, all of us could have worked harder with the Unionist community. We could have worked harder with people like Ian Paisley who called our money blood money. We made sure that our money only went into projects that had cross-community involvement and contributed to both Nationalists and Unionists. CC: I see a bust of President Kennedy on your bookshelf. Reading your book made think of his book, “Profiles In Courage”. Lyons: Thank you. That’s a flattering comparison. I know that he wrote every word of his book just as I wrote mine no matter what people say about his ghost writers. Just as he did, I wanted to put the focus not on me but on these people who made such an extraordinary difference that you’d never have heard of but for my book. CC: What’s your favorite memory of your time there? Lyons: It was when President Clinton flew into Belfast on Air Force One. As a member of the diplomatic delegation, I was supposed to go down the stairs at the front in advance of his departure from the plane. Instead, I went down the back stairs with the press because I wanted to be there and see the reaction of the people on the tarmac. For an American, seeing Air Force One is a staggering sight, but just imagine it on this tiny little place in the northwestern edge of Europe that’s been in turmoil for centuries with the President of the United States bearing a promise of peace and a better tomorrow – it was just absolutely astounding to me. I had no idea the impact the sight of the man and his wife would have on the people gathered there. CC: How involved was he in the peace process? Lyons: He was intimately involved. He read every memo that was presented to him because it was very important to him. I used to get memos that went up through channels come back with notes in his handwriting on them saying “What about this and what about that”. I don’t know if people there are aware of how deeply involved he was. I hope they are. CC: What do you see for the future? Lyons: They have the tools in place. The Good Friday Agreement has been modified by the St. Andrew’s Agreement that puts a political structure in place that’s proven and works. The people of Northern Ireland have to give it faith and that’s always a hard thing to do. I don’t think that whether the North remains a province of the U.K. or becomes independent, which works less well for the North than it does for Scotland – or unites with the Republic, and by the way, the overwhelming sentiment is still against unification – sooner or later, the economic and societal links between the two will strengthen and not be the barriers they used to be. It might take a generation or two. I hope it’s sooner. These are smart people and these are good people on both sides and as long as they give themselves the opportunity to appreciate the values held by each side, I think they’re going to be fine. CC: Thank you very much for your time. After nine years of playing together and numerous stage appearances with the likes of Martin Hayes, Dennis Cahill, Robbie O’Connell, Máirtín de Cógáin and others, the talented duo of Adam Agee and Jon Sousa has released their long-awaited joint CD. 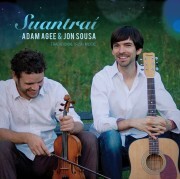 All too short at 10 tracks, the album is called “Suantrai” (Irish for lullaby) and features an assortment of traditional jigs, reels and airs, music written in the traditional style by contemporary artists and original music. The observations of these two members of the Masters of Tradition ensemble are borne out in this brilliantly conceived and executed debut album. The creative and thoughtful combinations, the seamless transitions and musical excellence manifest what Hayes and Cahill heard when they invited them to share the stage in 2012 at the Spanish Peaks International Celtic Music Festival. From the first track, the trad reel “Sporting Paddy” and John Brady’s “Siobhan O’Donnell’s”, featuring Jon’s guitar laying a percussive foundation for Adam’s fiddling, to the last track, “Amhran An Bha” (Song of the Drowning) a rarely heard largo lament, this album pleases the ear. And for the thoughtful listener with an interest in context, there is much to be found that enriches the mind with surprises throughout. For example, the second track, “John Naughton’s/Tommy Coen’s” is a combination of tunes done in 1981 by Mary MacNamara on concertina and Martin Hayes on fiddle. Adam and Jon’s version features Jon on banjo with Adam’s fiddle and honors the Clare tempo of the tunes. The seventh track sweetly combines Jon’s solo guitar on ”Maids of the Mourne Shore” (the tune used for “Down by the Salley Gardens”) with Adam’s fiddle on “Niel Gow’s Lament for the Death of His Second Wife”, another lovely and rarely heard tune that was featured in the Alison Krause and Natalie MacMaster collaboration “Get Me Through December”. Christmas is here and this is a great stocking stuffer for someone you love who loves trad music – and a not bad gift for yourself, at that. When John and Leslie Malone decide to get behind a project they don’t horse around. The Irish American Hall of Fame continues its mission to recognize and honor the outstanding contributions of Irish Americans to society in the areas of Arts & Humanities, Business & Industry, Public Service, Sports, Religion, Education and Science and has voted on a list of nominees for the class of 2015 to be announced in February. Among the impressive list of nominees is Emily Hanrahan Warner, born in Denver, Colorado, she made aviation history in 1973 when she was hired by Frontier Airlines as the first woman airline pilot for a U.S. scheduled airline. by aviation as a teenager, Emily quietly paid for her aviation training by working two jobs as a Department store sales clerk and secretary for Clinton Aviation. At 18 years old, she announced she had earned her pilot’s license. But, she dared not share her heart’s secret desire to become an airline pilot because the common wisdom was “girls could and should not fly”…and until Emily Hanrahan they had not. On April 10, 1973, Emily Hanrahan’s dreams took flight. She broke the glass ceiling of the flight deck becoming the first woman hired by a U.S. scheduled airline carrier as a pilot (in modern times) and took the controls of the Frontier Airline 737 flight #379A. 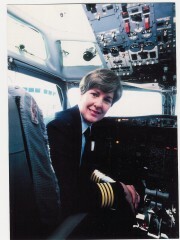 In 1974, she became the first woman member of ALPA – Air Line Pilot Association. By 1976, Emily became America’s first female Airline Captain. That same year, the Smithsonian National Air and Space Museum permanently enshrined her airline pilot uniform in Washington, D.C. Over the years, Emily Hanrahan Warner has been inducted into the National Women’s Hall of Fame (2002), Colorado’s Women’s Hall of Fame (2000), and Colorado Aviation Hall of Fame (1982). That same year, she was named Amelia Earhart Women of the Year. In 1991, she was inducted into the International Organization of Women Pilots 99s Forest of Friendship. The following year Women in Aviation International – WAI inducted her into their International Pioneers Women Hall of Fame. She has been named a Living Legend of Aviation (2007). She earned the 2011 International Ninety-Nines Award of Achievement for Contributions to Aviation. The book, Weaving The Winds, by Ann Cooper Lewis chronicles the illustrious aviation career of Emily Hanrahan Warner, a proud and outstanding Irish American. Emily is retired and continues to make Colorado home. 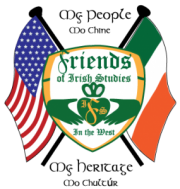 The Friends sponsored another very successful Christmas concert this year, but it was one with a special twist that brought the Irish of Montana and Ireland together to give us a top class show. Bringing the Irish of America and Ireland together ignites a creative spark and energy that would lift you off you seat. Many of those in attendance remarked that is was the best performance they had ever attended and it has proved inspirational for all those young artists who wish to continue celebrating Irish culture in Montana. The Friends is committed to building closer ties to Ireland and to giving the younger generation every opportunity to collaborate with artists from Ireland. We have, therefore, resolved to sponsor a series of concerts again this spring, the details of which are below. Before we leave the subject of the Christmas show, we would like to thank all the performers for their hard work and our sponsors who worked with us to make it such a success: LMG Security; Ireland Tile and Marble; The Ancient Order of Hibernians; and the Fulbright commission. Míle buíochas dhíbh uile. The raffle is our biggest fundraiser and will provide us with the means to support the Irish dance, music, language and history programs over the next two years. We need your help to make it a success. If every member committed to selling just two books of tickets to family, friends and colleagues, we would be in a very healthy position to provide this support. If you feel you can commit to selling some books, please contact us at friendsofirishstudies@gmail.com and we will get them to you. Thank you all so much for helping with this. We continue to grow the Friends Irish family and now have over 400 members. If you are not already a member, please consider joining and helping us build a bigger and stronger organization. You receive all kinds of benefits from membership. We would encourage you also to invite others to become a part of our great community. All arrangements are in place for our tour of Ireland this coming summer. The tour will run from June 20 to June 29, and we plan to keep the numbers to 20 travelers. This will enable people to get to know and build friendships with one another. This has always been one of the great outcomes of the tour to Ireland. If you are interested in joining us, please go to www.friendsofirishstudies.com for a detailed itinerary and sign-up form. 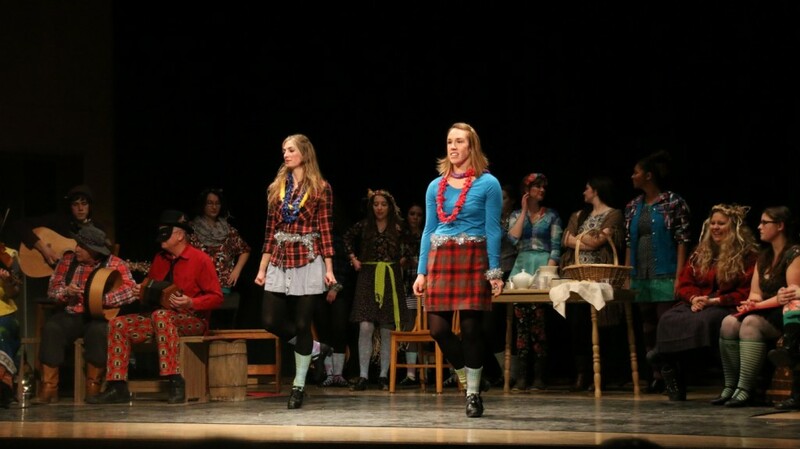 The Missoula Irish Dancers held their annual Christmas Recital on December 20th at the Hellgate Highschool Auditorium and what a success it was. Nearly 50 dancers of all ages participated before a packed house. It was truly uplifting to see these young dancers take the stage to entertain parents, grandparents and members of the public. And it is because of the active role that parents and grandparents take in Irish dance that our dancers can produce such a successful recital. We thank them for their support and wish them and our young dancers every success in 2015. The Friends are delighted to announce that they will once again sponsor a course in Irish music this spring. 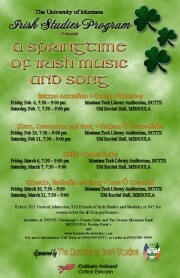 This course will give students and the community the opportunity to learn from the custodians of the Irish tradition, guest performers from Ireland who will address the class, provide workshops and give concerts in Missoula and Butte. Students will also learn to play the tin whistle and in this way come to learn the fundaments of Irish music. There are a total of four guests coming in February and March. Tickets are $45 for a season ticket; $15 general admission; and $10 for members of the Friends and students. The decision to offer the course came in the wake of the Irish Christmas concert and the numerous requests from both the performers and audience for further exposure to the music. The lineup of performers is given below. The music course was not part of our plan for 2015 so it imposes additional costs on us. Because the performers are coming from Ireland, the costs are very high, running about $25,000. We appeal again to your generosity to help us offset these costs. Donations, however small, will be greatly appreciated. You can donate online or send your donation to The Friends of Irish Studies, PO Box 4693, Missoula, MT 59806. The opening performer of the series ‘A Springtime of Irish Music and Song’ will be button accordion player, Danny O’ Mahony. Danny is a traditional musician from Ballyduff in North County Kerry. He grew up playing music with the older generation of musicians in his locality. Danny’s musical style is expressive and deeply personal, and reflects his affinity with the music of past masters. Danny’s performance abilities have been acknowledged through winning Junior & Senior All-Ireland titles and graduating from the University of Limerick with a Masters in Performance. The second concert of the series ‘A Springtime of Irish Music and Song’ will feature singer and musician, Eoghan Ó Ceannabháin. Eoghan is a sean-nós singer, flute and concertina player from Dublin. He comes from a musical family and performs regularly with his father, Peadar, and his two sisters, Saileog and Muireann. He is a member of the Dublin band Skipper’s Alley, winners of the Trophée Loic Raison at the Festival Interceltique de Lorient in 2013. Eoghan performed on Manx Gaelic singer Ruth Heggin’s debut album Sheear, which as released in February 2014. The third concert of the series will be performed by fiddler, James Kelly. James, a native of Ireland, is one of the greatest Irish traditional fiddlers alive today. He learned his music from his father John Kelly, the renowned fiddle and concertina player from County Clare, and began his recording and touring career at age sixteen. He has toured Europe, the US, Canada, and South America, was member of several influential Irish groups, including “Patrick Street” and the legendary folk group “Planxty,” and became one of the best-loved fiddlers of his generation. He has 18 albums to his credit and recently released his latest recording, “Melodic Journeys.”. The fourth and final concert will feature singer and musician, Liam Ó Maonlaí. Ó Maonlaí was raised in a traditional Irish-speaking home heavily influenced by the music and song tradition of west Kerry. He grew to become a master pianist and also excelled on guitar, tin whistle, harp and bodhrán. He was a founder member and lead vocalist for the one of Ireland’s most successful rock bands, The Hothouse Flowers, which released seven successful albums. His voice is such that Bono of U2 has described him as “the best white boy soul singer in the world.” In fact, it is the traditional song and the sean-nós style in particular that has always given expression to his soul and remains his greatest love.